This air intake system out-flowed the factory intake by 31%. 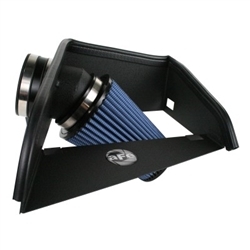 Includes a durable 16 gauge, powder-coated heat shield; this air intake system features a washable/reusable conical air filter that improves airflow for increased horsepower and torque. Heat shield requires little or no assembly and the filter is constructed with 100% polyurethane for long life and multiple cleaning cycles. 3-1/2" Conical Filter: This intake utilizes a huge, 3-1/2" conical Pro 5R performance air filter for maximum flow. This 5-layer progressive, oiled cotton gauze air filter provides maximum flow for increased horsepower and torque. This intake is 50-state legal for 2001-2005 models (CARB E.O Number D-550-3).